Aims: To explore the relation between lesion composition as assessed by fundus photography and fluorescein angiography with clinical measures of vision in eyes of patients with age related macular degeneration (AMD). Methods: A standardised visual function assessment along with colour stereo pair fundus photography was carried out in both eyes of 58 subjects with a confirmed clinical diagnosis of AMD. The size, location, and composition of the macular lesion (blood, exudate, subretinal fluid, pigment, membrane, atrophy, and fibrosis) were measured on the colour photographs using computer assisted image analysis. Of the 58 subjects, 44 also had concurrent fluorescein angiography. 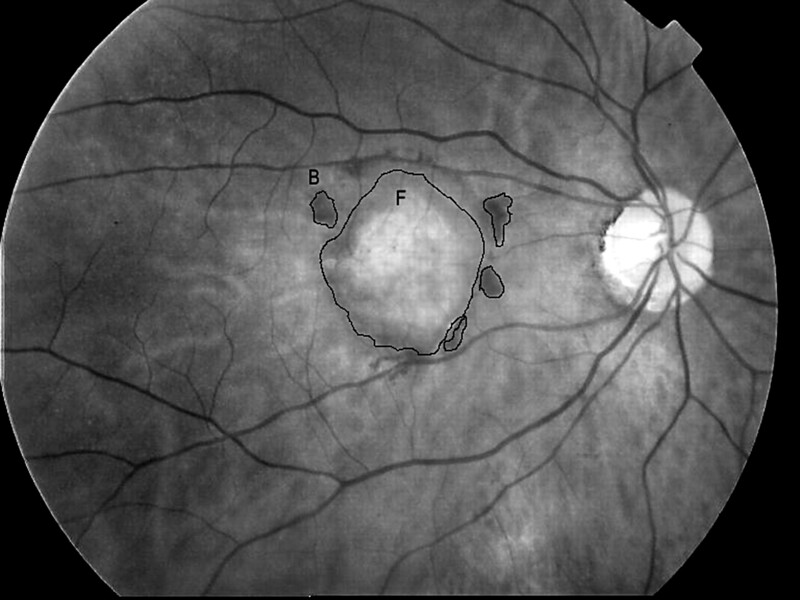 Classic and occult choroidal neovascularisation (CNV), blood, blocked fluorescence, fibrosis, geographic atrophy, and the total area of abnormal fluorescence were measured. Multiple linear regression was used to examine the relation between clinical measures of vision and the location and extent of lesion components identified by both colour and fluorescein image capture. Results: The composition of the macular lesion strongly influenced visual function, with atrophy (p=0.001) and fibrosis (p=0.002) accounting for most of the variation. When the location of the lesion with respect to the fovea was examined, fibrosis within the fovea significantly influenced all clinical measures of vision (p=0.008). The regression model selected the total area of abnormal fluorescence and a composite parameter (a semiquantitative measure of the following characteristics: atrophy, exudates, blood, and fibrosis ) from colour photography (r2 =0.52) as the variables that explained most of the variation in clinical measures of vision. Conclusions: The composition and extent of the macular lesion strongly influences visual function in eyes with AMD. Both colour photography and angiography yielded information, which together explained considerably more of the variation in the clinical measures of vision than either on its own. Age related maculopathy (ARM) represents a spectrum of gradual ageing resulting in degenerative changes in the human macula.1,2 The late stage of ARM that is associated with central visual loss broadly falls into two categories: non-neovascular and neovascular. These end stages are commonly referred to as age related macular degeneration or AMD. The non-neovascular and neovascular components are considered to represent different end points of a common pathophysiology with patients demonstrating a clinical picture with features of either dry or wet AMD in one or both eyes. There are multiple studies, which have examined visual function in eyes with early ARM.3–5 However, the relation between visual function and more advanced AMD lesions has not been explored systematically. Multiple cohort studies and clinical trials have shown that a wide range of visual function is possible in both treated and untreated eyes. Data from the MPS trial of argon laser photocoagulation for subfoveal choroidal neovascularisation (CNV) 6 showed that a sizeable number of eyes with large lesions had good visual acuity and conversely some eyes with small lesions had poor visual acuity. We therefore hypothesised that variability in the individual components of the neovascular response may explain the variation noted in visual function. Many of the various components of the neovascular response (such as blood, exudates, pigmentation, and fibrosis) are best recognised on colour stereo pair photography. Fluorescein angiography provides information on the type and extent of leakage and is used to delineate and classify the choroidal neovascular complexes. In the present study we used image analysis to quantify and describe the various components of the macular lesion in non-neovascular and neovascular AMD and related these findings to clinical measures of vision. The records of 110 consecutive patients with a clinical diagnosis of ARM in one or both eyes attending a specialised macular clinic at the Royal Group of Hospitals, Belfast, were scrutinised retrospectively. All patients had attended between January 1997 and December 1998. Clinical measures of vision (distance visual acuity (DVA), near visual acuity (NVA), reading speed, and contrast sensitivity (CS)) were available for all patients and had been carried out according to a specified protocol.7 The data pertaining to this study were taken from the baseline visit at which time none of the patients had received any interventional therapy to the presenting eye. Each subject had distance and near visual acuity, reading speed, and contrast sensitivity measured on each eye under standardised illumination. The optimal distance correction was obtained using a standardised refraction protocol. Acuity was measured using Bailey-Lovie charts according to the Macular Photocoagulation Study (MPS) manual of procedures. Near acuities were recorded through a +4.00 reading addition worn over the optimal distance correction. Near vision was measured for each eye using the Bailey-Lovie near visual acuity test types at 25 cm.8 These charts consist of a collection of randomly selected words, and when read at 25 cm the visual angle ranges from logMAR 1.6 to logMAR 0.0. Reading speed was measured wearing the same correction used for near acuity testing. The charts were prepared in house, and consisted of two paragraphs of a set number of unrelated words. Print size ranged from logMAR 0.3 to logMAR 1.0. At testing the subject was provided with a chart exhibiting text two logarithmic steps larger than their near acuity threshold. Smaller print sizes than logMAR 0.3 were not used, even if the subject’s near acuity was more than two steps better than this. Where near acuity was logMAR 1.5 or greater, it is impractical to provide appropriately sized text (logMAR 1.6) and reading speed could not be measured in these patients. For the purpose of statistical analysis, the reading speed was approximated to zero in such patients in this study. The subject is instructed to read out the words on the card steadily and the timer is activated as soon as reading commences. The timer is stopped when the subject has finished the paragraph or after 1 minute, whichever is sooner. Contrast sensitivity was measured using the Pelli-Robson chart.9–11 As recommended, the patient was seated at a distance of 1 metre from the chart which was positioned at eye level. A correction of + 0.75 DS was added to that used for distance acuity testing. Clinical evaluation included slit lamp biomicroscopy and fundus examination in both eyes of each patient. Fifty eight patients had colour stereoscopic fundus photography of the macular region of both eyes taken within a period of 1 week from the standardised visual function assessment. These 58 patients formed the cohort for the present analysis. The fundus photographs from four eyes of 58 patients were of such poor quality that meaningful images could not be obtained and these were therefore excluded. In two eyes, which had suffered massive exudation and haemorrhage, these lesion components extended beyond the vascular arcades and these were also excluded leaving 110 eyes available for analysis. The capture system used was the Topcon TRC 50X retinal camera and non-simultaneous macular stereo pair photographs were taken on Kodachrome ASA 25 film. For the purposes of locating the lesion and to measure the area of its various components, images were converted into digital format. One of each pair of the 35 mm stereo slides was loaded onto a carousel, and scanned using a Kodak Professional RFS2035 Plus Scanner. The software package Adobe Photoshop 4.0 was used to capture and convert the selected images into a digital file. For digitisation the scanner was set to 500 pixels per inch (PPI) at an image size of 557 × 490 pixels. The resolution was set to 500 PPI as resolution was good with a reasonable image size. The images were acquired as 16 bit colour TIFF files with lossless compression. They were transferred into an uncompressed bitmap file using a software package, Wang Imaging, downloaded from the internet at http://www.users.csionline.net/∼arteiii/wangscan.html. In this form the images could be read using “Osiris” a program downloaded from the internet at http://www.expasy.ch/UIN/html1/projects/osiris/osiris.html. The digitised images of the fundus photographs were viewed on screen. The 35 mm stereo pairs were viewed with stereo viewers and concurrently compared with the computer images to ensure that any artefact produced during image capture was not mistaken as part of the lesion. Image analytical tools were used to outline the area of the entire lesion and components of the lesion (Fig 1). All discrete areas of fibrosis, atrophy, exudate, blood, and pigment were outlined when they occupied an area equal to or greater than 25 pixels, as areas smaller than this could not be delineated. At the commencement of the study two observers undertook measurements independently of each other on a series of images with an agreement of 0.69. Thereafter all images were analysed by both observers working together. Fundus image showing a fibrotic choroidal neovascular membrane. The margins of the fibrotic area (F) and the discrete areas of blood (B) were outlined using the tools as described in the text. Fibrosis was defined as white or yellow fibrotic tissue overlying the CNV lesion. Geographic atrophy (GA) was defined as areas of pallor with distinct edges with a diameter in excess 30 pixels (corresponding to circle I, Wisconsin grading system12). Large choroidal vessels were usually clearly visible within these areas.12 Any GA remote to the macular lesion was not included and no patient in this series had GA only. Exudates, blood, and pigmentation were easily recognised on the colour stereo pairs. Subretinal fluid (elevation of the neurosensory retina) and CNV (a greyish membrane), which are integral components of neovascular AMD, although readily identified were often diffuse and not easily outlined. To grade these two characteristics the following system was used: 0 = absent, 1 = present. The area of each component if discrete was recorded as pixels. Macular Photocoagulation Study Group definitions for fundus photographic and angiographic features were used to classify the lesions.13 We outlined the foveal avascular zone (FAZ) from the tips of the vessels forming the foveal arcade. These marks tended to form an oval-shaped outline, which was the boundary of the FAZ. Those components of the lesion which encroached into the FAZ were considered subfoveal. For those eyes where the morphological details were obscured by scarring we assumed that the position of the geometric centre of the fovea was located two disc diameters temporal to a point taken at the 6 o’clock position of the superior edge of the inferior rim of the optic disc. This assumption was made based on a previous study in which we had morphometrically analysed angiograms to determine the location of the geometric centre of the FAZ. Components of the lesion, which lay outside the foveal avascular zone, were defined as macular. The boundaries of the macular retina were the temporal rim of the optic disc nasally, the closest vessels of the superior and inferior vascular arcades to the geometric centre of the fovea, and an arbitrary cut off temporally, which was 2.0 disc diameters temporal to the geometric centre of the fovea. Calibration was required to convert pixels to millimetres to allow the areas to be calculated. It has been previously shown that the diameter of any major retinal vein at the edge of the optic disc is remarkably constant and can be taken as 125 μm. Therefore for the purposes of calibration the diameter of a major vein at the optic disc was measured in 20 eyes, taking three independent readings from each eye. The diameter of the major vein was found to be 6.0083 pixels. Each pixel was therefore 0.02 mm. This was performed using an OIS digital angiography system (Sacramento, CA, USA). The angiographic series were displayed on screen for analysis. For the purposes of angiographic classification and for measurement of blood, fibrosis, classic and occult leakage the definitions as outlined in the MPS study were applied.13 The following were recorded—presence of blood defining the borders of the lesion (yes, no), percentage of classic component of the lesion (0 = none, 1 = <50%, 2 = >50%), presence of fibrosis (0 = none, 1 = 1–25%, 2 = 26–50%, 3 = 51–75%, 4 = >75%). The area of geographic atrophy, the area of hyperfluorescence (all CNV, classic, and occult), and the entire area of abnormal fluorescence (hyperfluorescence and hypofluorescence) were measured. Classic leakage was defined as distinct area(s) of hyperfluorescence which appear early (within 30 seconds) in the angiographic frames. The leakage expands and intensifies in the later frames of the angiogram. Occult leakage was defined as indistinct areas of hyperfluorescence, which appear early or late and intensify over time. Area parameters were measured using a clear overlay with discrete circles of specified diameters. The diameters corresponded to MPS optic disc areas (1, 2, 3, 3.5, 4, 5, 6, 12, 15, and 20), which were calculated taking into account the magnification of the system of capture. Knowledge of the magnification factor allowed the actual area in square millimetres to be calculated. The circle, which provided the best fit for each of the parameters measured, was recorded. All data were entered into a database and analysed using a standard statistical package. Lesion components (subretinal fluid, visible CNV, blood, pigmentation, exudate, fibrosis and atrophy) were cross tabulated by their presence and location with respect to the fovea. A component could be absent in both the macula and the fovea, present in the fovea (and thus by definition also present in the macula), and present in the macula but not the fovea. For most lesion components this last category was under-represented in the sample and therefore not of value in a multivariate analysis. The t test for comparison of means was used to examine for differences between clinical measures of vision in eyes when subdivided by the location of the lesion with respect to the fovea. Lesion components were noted to have a wide size distribution and therefore in order to facilitate the analysis of the relation between the explanatory variables (lesion components) and clinical measures of vision it was necessary to convert the former to an ordered categorical scale. A score of 0 was assigned if the feature was absent and 1 if present but not definable. Discrete areas >0.0–0.49 mm2, ≥0.5–<5.0 mm2, ≥5.0 to <50.0 mm2 were assigned the values of 2, 3, and 4 respectively (Table 1). All components measured on stereo colour photographs—that is, subretinal fluid, CNV, blood, atrophy, exudate, pigment, and fibrosis were entered into a regression model. The score from four specific components (atrophy, fibrosis, blood, and exudates, which on linear regression was found to significantly influence clinical measures of vision) were summed to obtain a composite measurement reflecting the total extent of the lesion. Summing the scores gave a range of between 0 and 16 and the scores were found to be continuously distributed. It is accepted that a degree of association exists between the two eyes of an individual and this relation prevents such data from being analysed as independent variables. Therefore we included “person” as a fixed effect, in a general linear model with the area scores of each of the components of the macular lesion as the main outcome variables and clinical measures of vision as the co-variates. By so doing we used the individual’s better eye to control for the visual function in their worse eye. Models containing distance and contrast sensitivity as the dependent variable excluded “person” effects. However, the model based on near acuity revealed a just statistically significant contribution from the person effect. We therefore analysed our data using the general linear model in which person was included as a fixed effect. In the final part of the analysis we wished to examine correlations between data collected by fundus photography and those collected from fluorescein angiography. Once again we looked for interclass correlations (person effects) but no significant contribution was found. We therefore used linear regression to explore the relation between measurements made on fundus photographs and those made from the fluorescein angiograms. Thirty seven females and 21 males comprised the study cohort and the average age at inclusion was 72 (SD 10) years. Six subjects had one eye with only features of early ARM and therefore scored 0 for every lesion component. In the eyes with a measurable macular lesion the mean area was 12.69 (1.19) mm2. Tables 2 and 3 show the number of eyes with subretinal fluid, atrophy, CNV, fibrosis, pigment, exudate, and blood, categorised by their location (that is, involving fovea or macula). In all instances for any component, fewer cases exhibited foveal involvement when compared with macular involvement. Comparison of means showed that only foveal fibrosis was associated with significantly worse distance and near visual acuity and contrast sensitivity (Table 2) when compared with eyes without foveal fibrosis. The presence or absence of other lesion components in the fovea did not significantly affect clinical measures of vision. With respect to lesion components within the macula, atrophy and fibrosis significantly affected clinical measures of vision when compared with eyes not exhibiting these features (Table 3). The general linear model, which was used to investigate interclass correlation, showed that within person effects reached significance with near visual acuity, thus precluding the use of the 110 eyes as independent observations. This model showed that all of the clinical measures of vision were significantly correlated with the extent of macular atrophy and fibrosis (Tables 4 and 5). The extent of macular blood and exudate also showed significant correlations with some of the clinical measures of vision whereas macular pigment had no significant correlation with any of these measures. The model, which incorporated near visual acuity as the dependent variable and the components of the lesion as covariates, gave highest correlations indicating that near visual acuity is the best exponent of the variation in the regression model (R2 = 0.48). Regression analysis using all angiographic and colour photographic area parameters as the independent variables, and clinical measures of vision as the dependent variable, showed that the model which included total area of abnormal fluorescence (angiographic) and the composite score (colour images) was highly significant (p<0.000) with R2 of 0.52. Regression analysis using the backward elimination approach showed that the area of abnormal angiographic fluorescence was the principal parameter influencing near visual acuity and all other clinical measures of vision (Tables 6 and 7). Atrophy measured on colour fundus photographs and atrophy measured in terms of disc diameters on the fluorescein angiograms was also compared and a highly significant association was found (p<0.01, two tailed test). Regression analysis using near visual acuity as the dependent variable, and the methods of measuring atrophy as the independent variables, showed that atrophy measured on colour photography remained a significant predictor of visual function. When eyes were classified by the proportion of classic leakage with respect to total lesion size, univariate analysis of variance showed a strong adverse effect on all measures of visual function which was most marked with near visual acuity (F = 10.2, p <0.001). The location of the lesion. The presence of the lesion in the foveal avascular zone,14 and decreasing distance of the posterior edge of the lesion from the fovea15 have been shown to correspond with poorer vision. In the present study, we initially investigated the relation between clinical measures of visual function and the morphological characteristics of the macular lesion captured using fundus photographs in patients with the wet form of AMD. When the location of the lesion was taken into consideration only fibrosis within the fovea was associated with notably worse visual function in comparison with eyes not exhibiting this feature. Fibrosis, owing to its morphological characteristics, is clearly associated with severe pathological effects on the architecture of the retina. However, atrophy may easily spare islands of retinal tissue that are still capable of functioning. Thus, atrophy is more likely to be compatible with maintained function than fibrosis. We also found that of the many macular lesion characteristics examined, fibrosis and atrophy within this location influenced visual function in a highly significant manner. The general linear model of regression analysis showed that the extent of these components also influenced visual function in that eyes with larger areas of atrophy and fibrosis also had poorest visual acuity. Two other components, blood and exudate, also influenced visual acuity adversely but to a lesser degree than atrophy and/or fibrosis. However, eyes exhibiting pigmentation, subretinal fluid, and CNV in the macular lesion were no more likely to have worse vision than those eyes with macular lesions without these components. When the pathogenesis of the lesion components are considered, their impact on visual function is not surprising. Fibrosis usually represents the end stage of neovascular AMD with destruction and distortion of most of the sensory retina, pigment epithelium, and inner choroid by the formation of a fibrovascular disciform scar. Atrophy which can occur in either type of AMD obviously has a severe effect on visual function as it involves the wasting away of the neuroretina, retinal pigment epithelium, and choriocapillaris. The collection of exudates under the neurosensory retina is often associated with cystoid degeneration, which is inimical to neuroretinal function. In the present study subretinal exudation was associated with poorer vision but its impact was less than that noted with fibrosis and atrophy. It was noteworthy that correlations between the various measures of visual function and lesion components, although significant, were only modest. However the construction of a model which included the most important components (fibrosis, atrophy, blood, and exudate) along with a weighting dependent on the ordered categorisation of the extent of the component, resulted in improved correlation coefficients. Our findings therefore imply that the extent and composition of the lesion are important factors in predicting visual function and support the observations of Bressler et al,14 who found that fibrosis and scarring was associated with significantly poorer acuity when compared with those eyes that did not exhibit these characteristics. The addition of the angiographic parameters to the regression model provided additional information on the relation between visual function and the macular lesion and boosted the R2 value to 0.52. The overall area of abnormal fluorescence was found to be the best predictor of visual function, as it was highly significantly associated with each of the clinical measures of vision. Therefore, the regression model which combined data obtained through analysis of colour fundus photographs and angiography demonstrated enhanced correlation coefficients when compared with those based on one method of image capture alone. Our findings therefore support the view that both methods should be used for studies of this nature. This study has also clearly shown that specific lesion components have a greater impact on visual function than others and information of this type may be useful when selecting outcome parameters for analysis in future clinical studies. This study was supported in part by a strategic project grant from the Medical Research Council of the United Kingdom and by a grant from the PPP Foundation. Bergink GJ. Radiotherapy for subfoveal choroidal neovascularisation in ARMD. Alblasserdam, Netherlands: Haveka BV, 1998:12–40. Mullins RF, Johnson LV, Anderson DH, et al. Characterization of drusen associated glycoconjugates. Ophthalmology 1997;104:288–94. Cheng AS, Vingrys AJ. Visual losses in early age-related maculopathy. Optom Vis Sci 1993;70:89–96. Eisner A, Stoumbos VD, Klein ML, et al. Relations between fundus appearance and function. Eyes whose fellow eye has exudative age-related macular degeneration. Invest Ophthalmol Vis Sci 1991;32:8–20. Eisner A, Klein ML, Zilis JD, et al Visual function and the subsequent development of exudative age-related macular degeneration. Invest Ophthalmol Vis Sci 1992;33:3091–102. Macular Photocoagulation Study Group. Visual outcome after laser photocoagulation for subfoveal choroidal neovascularisation secondary to age-related macular degeneration. The influence of initial lesion size and initial visual acuity. Arch Ophthalmol 1994;112:480–8. McClure ME, Hart PM, Jackson AJ, et al. Macular degeneration: do conventional measurements of impaired function equate with visual disability? Br J Ophthalmol 2000;84:244–50. Bailey IL, Lovie JE. The design and use of a new near vision chart. Am J Optom Physiol Opt 1980;57:378–87. Pelli DG, Robson JG, Wilkins AJ. The design of a new letter chart for measuring contrast sensitivity. Clin Vis Sci 1988;2:187–99. Mangione CM, Gutierrez PR, Lowe G, et al. Influence of age-related maculopathy on visual functioning and health-related quality of life. Am J Ophthalmol 1999;128:45–53. Ferris FL III, Fine SL, Hyman L. ARMD and blindness due to neovascular maculopathy. Arch Ophthalmol 1984;102:1640–2. Klein R, Davis MD, Magli YL, et al. The Wisconsin age-related maculopathy grading system. Ophthalmology 1991;98:1128–34. Macular Photocoagulation Study Group. Subfoveal neovascular lesions in age-related macular degeneration. Guidelines for evaluation and treatment in the Macular Photocoagulation Study. Arch Ophthalmol 1991;109:1242–57. Bressler SB, Bressler NM, Fine SL, et al. Natural course of choroidal neovascular membranes within the avascular zone in senile macular degeneration. Am J Ophthalmol 1982;93:157–63. Weiter JJ, Delori FC, Wing GL, et al. Relationship of senile macular degeneration to ocular pigmentation. Am J Ophthalmol 1985;99:185–7. Sunness JS, Gonzalez-Baron J, Applegate CA, et al. Enlargement of atrophy and visual acuity loss in the geographic atrophy form of age-related macular degeneration. Ophthalmology 1999;106:1768–79.